NOTE: An autonomous car (driverless car, self-driving car) is a vehicle that is capable of sensing its environment and navigating without human input. For the most part, self-driving cars being tested by Google and other carmakers are running their experiments in relatively safe environments in California and Texas, where the weather is generally fine. But last month, a company spokesman said, Google sent its self-driving cars to snowy Lake Tahoe [Nevada] to collect important test data. Google’s car is equipped with special wiper blades that help keep the car’s camera lenses clear in bad weather. And if it’s in the middle of a particularly nasty storm, the vehicle can automatically pull over and wait it out, according to a recent company report. Like real people, being unable to see can be a huge problem for a machine that relies on cameras, radar and laser-based sensing systems. In addition to the risk of snow or ice building up on external sensors, even an inch of snow cover on the ground could disrupt an autonomous vehicle’s sensitive systems. Ford’s test vehicle has trouble “seeing” much farther than the cloud of snowflakes in front of it. That’s because the sensing systems designed to bounce signals off of distant objects are reflecting off of the snow instead, resulting in what looks like a cloud of angry bees surrounding the car. The solution, Olson said, is to train the car’s cameras on its surroundings — to rely on passing buildings, street poles and even trees to determine its location. From there, the car can match those reference points to the map that’s stored in its brain. But low visibility is just one aspect of the problem. “In a snowy climate, people aren’t driving in their lanes anymore. They’re driving in the tire tracks of the guy in front of them,” said Ryan Eustice, who directs the University of Michigan’s Perceptual Robotics Lab and has also been working with Ford. In other words, humans know that it’s sometimes safer to break the rules of the road when it’s snowing than it is to obey them. But how do you teach a machine to defy its own programming? That’s not all. On top of knowing the difference between bad weather and a sensor malfunction — and how to behave “improperly” — autonomous vehicles may also have to communicate with, or even fight, other safety systems in the car in order to drive the way a human would. For example, anti-lock brakes and electronic stability control have helped human drivers avoid crashes for years. But software makers for driverless cars don’t necessarily have control over those features because they are sometimes made by third-party suppliers, said Olson. The result could be that these features kick in when the computer least expects it. The fact that we’re still so far from building an all-weather driverless car will probably mean that manufacturers will release their earliest autonomous vehicles only to certain cities at first, or allow drivers to turn on the robotic features under a specific set of conditions. So while driverless cars are definitely coming, don’t expect them to be able to get you through a whiteout anytime soon. Reprinted here for educational purposes only. May not be reproduced on other websites without permission from The Washington Post. For the original article, visit washingtonpost .com. 1. Until recently, where have all self-driving cars been tested? 2. What two features does Google’s self-driving car have that help in bad weather? 3. What is Google’s self-driving car able to do when driving in rain? 4. Why do snow and ice negatively affect self-driving cars? 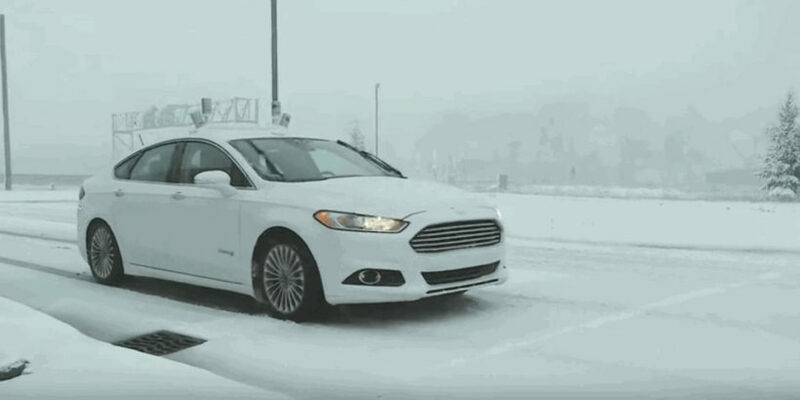 5. a) What problem does Ford’s self-driving test vehicle have when it is snowing? b) How has Ford been able to address this issue, according to Edwin Olson? 6. Describe the two additional problems faced in snow that designers of self-driving cars must address. 7. Ask a parent or grandparent (someone who has driven in snow): Would you prefer to drive yourself or have a self-driving vehicle in snowy (or other bad weather) conditions? Explain your answer.